The Spectral UL-38 HD Ultralinear III cable is the foundation choice for speaker interface with Spectral high-speed amplifiers. UL-38 Ultralinear III has been designed to offer maximum overall performance with an emphasis on high value. The UL-38 is a dedicated Spectral cable network which assures the precision time alignment, critical termination and tuned roll-off required for stable operation of Spectral’s megahertz amplifier designs. This proprietary tuning of UL-38 gives Spectral amplifiers broad stability margin into the most complex and difficult speaker loads. As a result, UL-38 Ultralinear achieves the overall performance envelope of more expensive MIT cables for exceptional sonic balance and inner life. UL-38 Ultralinear III is the perfect match for the UL-230 Ultralinear interconnect and combines with Spectral components for powerfully real and transparent reproduction. The Spectral UL-38 Ultralinear III cable represents a fine balance of performance and value in the Spectral system. 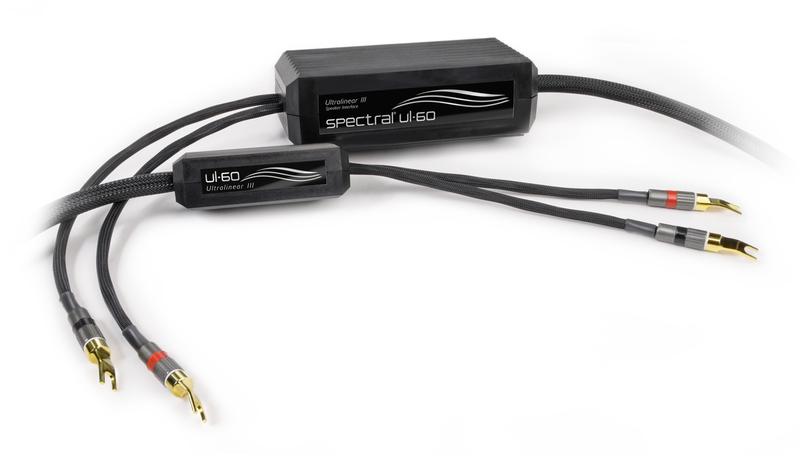 The Spectral UL-60 HD Ultralinear III speaker cable is our reference speaker interface in the Spectral system.UL-60 Ultralinear has been designed to offer reference level performance with Spectral amplifiers and introduces a new generation MIT Matrix design optimized for our ultralinear application. UL-60 Ultralinear is inspired by decades of advances made in the Spectral MH-770 series speaker cables which culminated in the world recognized MH-770 Ultralinear II. The new generation Spectral UL-60 continues this leading edge tradition with significant improvements in performance and value. All of MIT’s patented design features are optimized for the Spectral system in the UL-60 Ultralinear for a new level of accuracy and realism. UL-60 Ultralinear is the ideal match for Spectral’s reference series of high-resolution audio components. The MH-60 Ultralinear III is a solid advancement in sonic excellence and value and will compliment any Spectral reference system. All files are copyright 2013 by Spectral Audio, Inc.